It seems very wrong to write a post that talks about Trace, after all I’ve done to advocate that everyone start using Extended Events (XE). However, I know there are a lot of you who still use Trace because you’re running SQL Server 2008R2 and earlier, so you all get a free pass. Until you upgrade. If you’re running SQL Server 2012 or higher, I strongly recommend that you use XE. But that’s the not the main point of this post. What I really want to do is step through filtering a .trc or .xel file to remove selected events. Once you select Apply, all events before 11:31PM will be removed, as well as those with less than 1000 logical_reads. 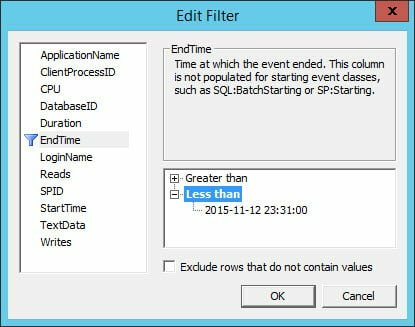 The remaining events can again be saved to a new file (Extended Events | Export to | XEL File…), or you can just run analysis against the filtered data. You can remove the filter at any time by going back to the Filters window and selecting Clear All. Hopefully this helps if you ever need to remove events from a .trc or .xel file. Note that I always save the filtered data as a new file – I prefer to keep the original just in case I need all the events for some reason.